These tiny ivory mice were handed down to me by my grand-mother. 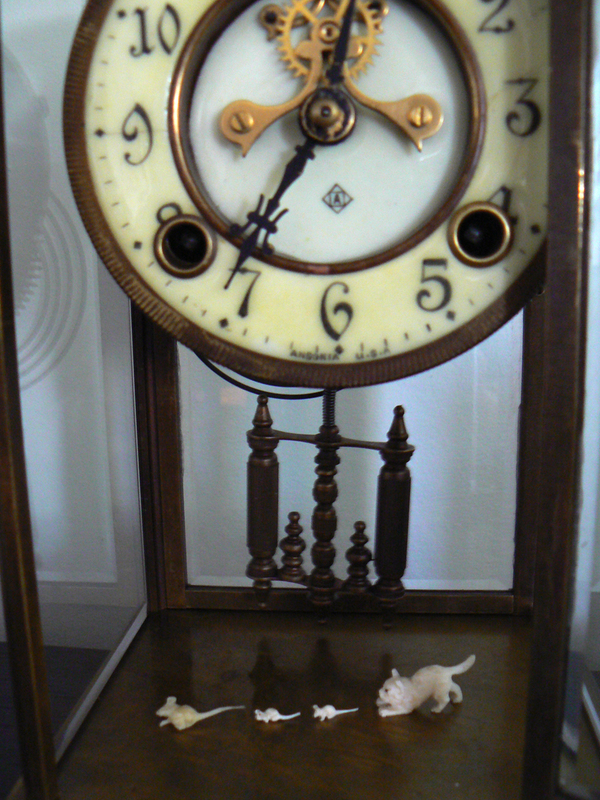 It’s a miracle they have survived; she kept them secure in the china cabinet and I bought this pretty clock from an auction especially to accommodate them. It’s seems such a good place to keep the mice; Hickory, Dickery Dock! Although the thought of ivory-hunting is abhorrent, one has to admire the delicate carving of these little creatures (the largest is about the size of pea). My father collected clocks and I think he would have liked this one. All the ones he left me were stolen, so this one is an “honorary hand-me-down”. Joanna, 67, Artist, Chiswick, London, UK.